» A 1001 MIDNIGHTS review: MILTON PROPPER – The Family Burial Murders. A 1001 MIDNIGHTS review: MILTON PROPPER – The Family Burial Murders. MILTON PROPPER – The Family Burial Murders. New York: Harper & Brothers, 1934. 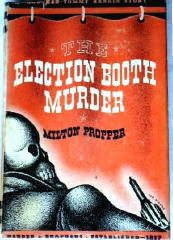 Hardcover reprint: Grosset & Dunlap (cover shown). 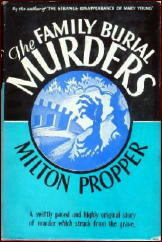 Milton Propper was born in 1906, graduated from the University of Pennsylvania Law School with honors in 1929, and saw his first detective novel published the same year. He never practiced law but went to work in the mid1930s for the Social Security Administration and continued mystery-writing on the side. His fourteen whodunits are usually set in Philadelphia and its suburbs and feature young Tommy Rankin, the homicide specialist on that city’s police force. Propper was far from a paragon of all the literary virtues. He wrote dull prose, peopled his books with nonentities, flaunted like a badge of honor his belief that the police and the powerful are above the law, and refused to play fair with the reader. Yet paradoxically his best books hold some of the intellectual excitement of the early novels of Ellery Queen. 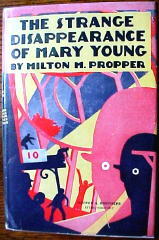 Propper generally begins with the discovery of a body under bizarre circumstances: on an amusement park’s scenic railway in The Strange Disappearance of Mary Young (1929); during a college-fraternity initiation in The Student Fraternity Murder (1932); in a voting booth in The Election Booth Murder (1935). Then he scatters suspicion among several characters with much to hide, all the while juggling clues and counterplots with dazzling nimbleness. His detectives are gifted with some extraordinary powers — for example, they can make startlingly accurate deductions from a glance at a person’s face — and have no qualms about committing burglary and other crimes while searching for evidence. Propper novels often involve various forms of mass transportation and complex legal questions over the succession to a large estate. Near the end, having proved all the known suspects innocent, Rankin invariably puts together some as yet unexplained pieces of the puzzle, concludes that the murderer was an avenger from the past who infiltrated the victim’s life in disguise, and launches a breakneck chase to collar the killer before he or she escapes. Such is the Propper pattern. One of the books in which it shows to best advantage is The Family Burial Murders, whose opening is reminiscent of Ellery Queen’s 1932 classic The Greek Coffin Mystery. Rankin is summoned to one of Philadelphia’s stately mansions after one body too many turns up at the gravesite during the funeral of a wealthy dowager. The old lady clearly died of natural causes, but her nephew, who also lies in her coffin, was just as clearly murdered, and Rankin’s investigation turns up an assortment of suspects with motive and opportunity. Propper juggles the legal tangles surrounding the dead woman’s estate with an array of trains, trolleys, elevated lines, and interurban electric trams that give him the crown as mystery fiction’s number one transportation buff. Unlike his novels, Propper’s life became ever more wretched and messy. He alienated his family, lived in squalor, was picked up for homosexual activity by the police whose lawbreaking he had glorified, eventually lost all markets for his writing and, in 1962, killed himself. Judging by letters he wrote to Time magazine, Propper was a Democrat who supported Franklin Roosevelt and opposed the corrupt GOP Philadelphia machine. Not sure how that squares with what Nevins wrote was his belief that the rich and powerful should be above the law. Propper hardly was alone among Golden Age writers in having his police commit warrantless searches/break-ins. Crofts did this all the time, for example. Admittedly, Propper does seem to write a great deal about the PA elite. His book The Station Wagon Murder dates back to the time when it would have been a big thing to own a station wagon. Anyway, he’s another one on my to read list.